What do you think about Nando? 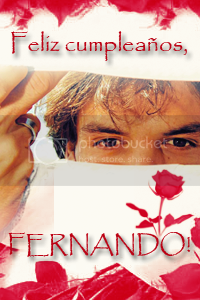 Fernando Morientes turns 33 years today! Happy Birthday, Nando. We wish you were happy, lucky and healthy! Estamos contigo! Мы глубоко извиняемся за перерыв в работе сайта и обещаем, что больше такого не повторится. Fernando Morientes-Jr turns 9 years today! Valencia forward Fernando Morientes was released from hospital on Friday after recovering from severe abdominal pains. Morientes was admitted to hospital in the early hours of Tuesday morning complaining of stomach pains and fever, and has spent the last three days under observation. After responding well to treatment the player has been given the green light to leave, but will still be unavailable for Valencia's game against Osasuna on Sunday. Two goals inside the first 11 minutes helped give Valencia coach Ronald Koeman a night to savour, after a miserable season in La Liga, as his men beat Getafe 3-1 in the Spanish King's Cup final on Wednesday. Failure to win the Cup would almost certainly have seen Koeman depart company from the Spanish side, who have only won one of their last nine league games, perhaps even being sacked before the end of the season. However, now that Valencia have ensured a return to European competition next year after lifting their seventh Spanish Cup, the under-fire Dutchman may yet have a future at the club and be able to mould it in his image. Valencia struck quickly to take control of the game being played in Atletico Madrid's Vicente Calderon stadium, just a few kilometres from Getafe's home in the Spanish capital's southern suburbs. Ситуация такова, что в силу ряда причин оказался закрыт единственный в своем роде сайт, посвященный Фернандо Морьентесу - Fernando Morientes Zone. Искренне надеемся на поддержку болельщиков. Сайт пока находится в стадии разработки.